So this might seem a bit weird. Why would a Greek go to see The Real Greek chef make moussaka? “Isn’t it like your national dish?”, “Don’t you know how to make it from birth?” Yes, thank you I get the point, even though I learned how to make it when I was 23. 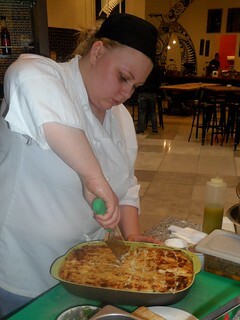 When I got the e-mail for a moussaka making experience from the lovely Megan I thought exactly that. However, I’m always learning so I really wanted to see this staple of the Greek family table done from a professional chef. Secondly, I had completely stopped going to The Real Greek three years ago so I was super curious. So, this is the story about how I changed my mind and a few handy notes on moussaka. Moussaka can be considered the Greek lasagne even though that does not do it justice. It is a layered bake effectively with Bechamel sauce, mince meat, potatoes and aubergines. 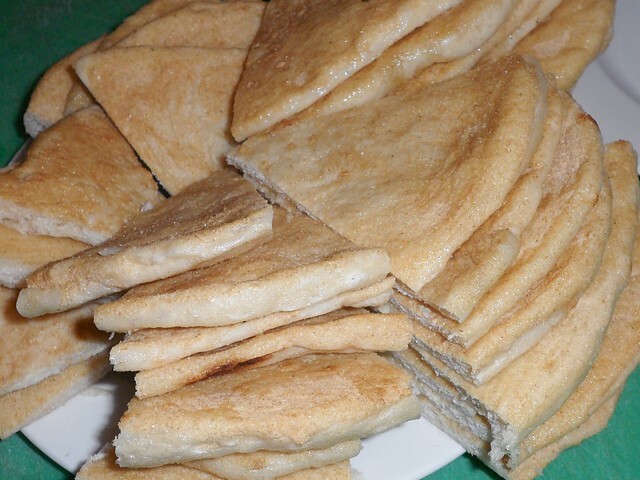 It is exceedingly yummy and definitely a Sunday dish because it takes a while to prepare. 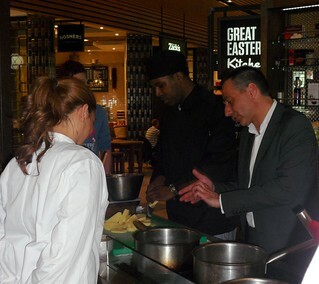 On Wednesday evening I made my way to the open kitchen at the Westfield Stratford Great Eastern Market. The lovely Megan and Tom were there, with chef Alan (he rocks), Christos who is the Head of Operations at The Real Greek (and gracious host) and Monika (so efficient and polite). 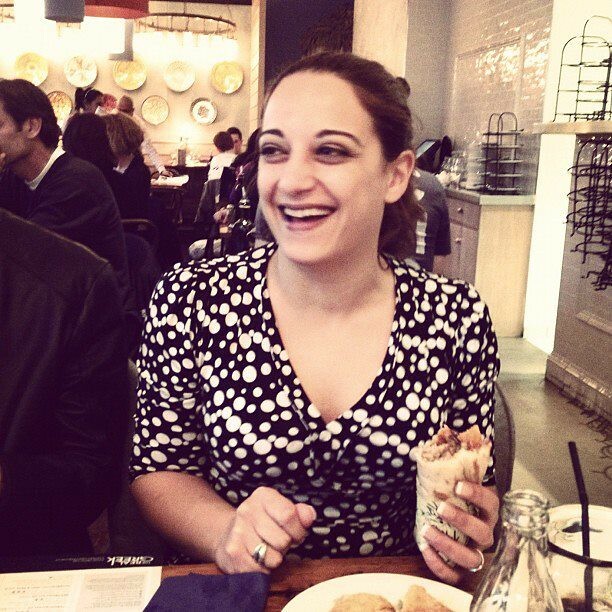 On the bloggers’ front I met Fiona (of London Unattached) and Giulia (of Mondo Mulia). 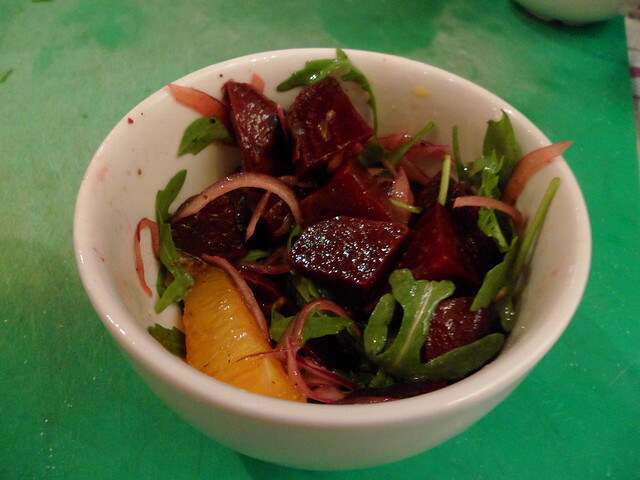 We watched (OK, we helped a bit and asked a thousand questions) as chef Alan made moussaka, a beetroot salad (super yummy) and tarama salad (which I don’t eat but my partner simply loves so that’s going to come in handy). Right. 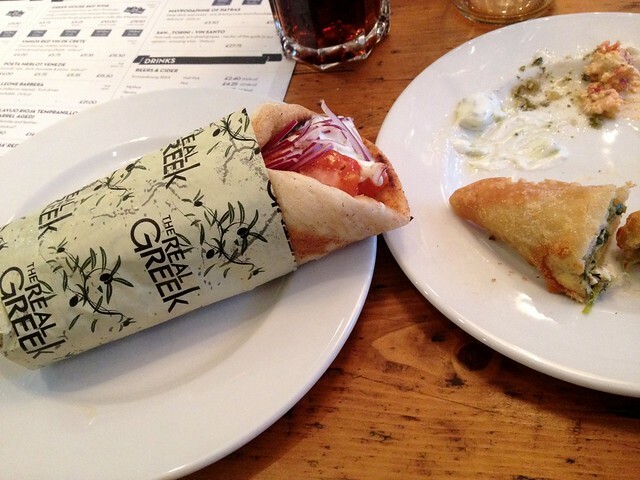 If you had been disappointed by The Real Greek in the past – I was, big time – I would recommend giving them another try now. 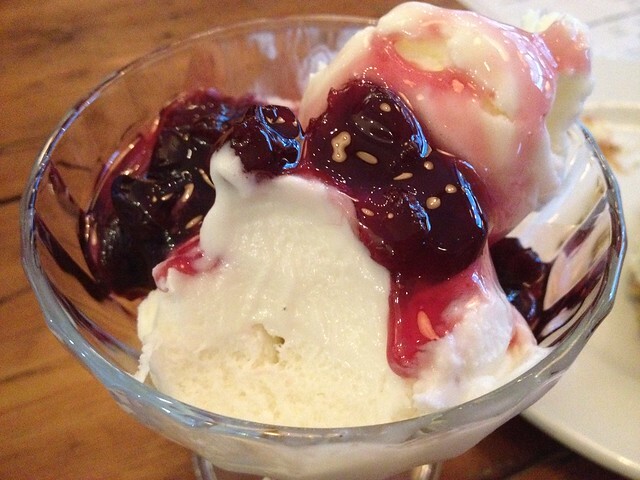 You know I’m not a food snob and if I wasn’t sincere I wouldn’t be writing this post. So, you may like to drop in again. 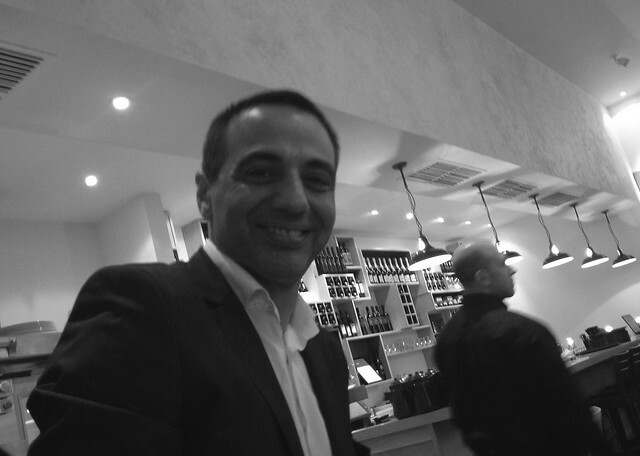 Christos joined the company lately and brought his experience from Greek restaurants. Not only that but he also brought his dad (oh yeah) who has been cooking Greek professionally all this life to work with chef Alan and his team to improve the menu. And improve it they did. The meze are lovely. They serve a mean tzatziki, very authentic, and a Htipiti with a kick. It’s rare to find those two made in a way that a Greek likes them but like them I did. They also serve Gigantes (butter beans in tomato sauce) the right way (that is, COLD, thank you very much). I would have liked the melitzanosalata a bit more smoked but the texture is right, chunky, not yucky smooth paste. The revelation of course is their souvlaki. They have completely changed the way they make it, from the pitta (the real Greek pitta, not that abomination marked “Greek pitta” in super markets), the filling and the meat. I had the pork souvlaki and it was good. No more huge chunks of dry pork. Just tender meat with the right amount of fat. Ask them how they make it. If you’re Greek you’ll find the idea a bit weird so I’m not sharing. Try it first, ask them after. 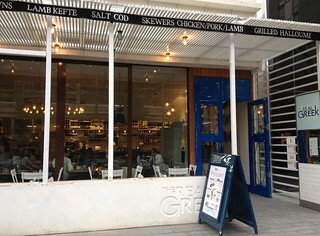 Christos’ philosophy is “simple food, done the traditional Greek way“. And that philosophy has permeated the new menu and new way of doing things apparently. Case in point, their moussaka recipe. I don’t know who spread the rumor that Greeks use minced lamb but we don’t. We just don’t. Lamb is for roasting whole (remember the Greek Easter post?) or for the oven. It’s not for mincing and spreading over your moussaka. It makes the dish incredibly smelly. So you can imagine that I was watching chef Alan like a hawk (poor man). When he said the magic words (“mince beef”) I knew the moussaka would be good. 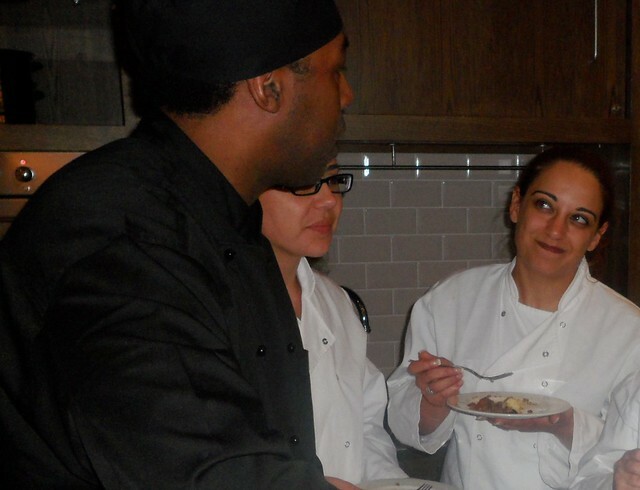 He also gave some excellent pointers on the bechamel sauce. 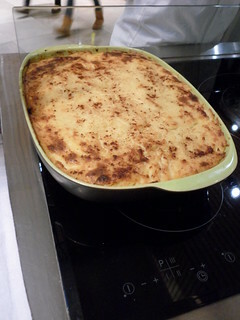 It took me YEARS to do a good bechamel sauce for moussaka and pastitsio (another lasagne-like dish). I’ve found that one of the key tricks is that you should never EVER stop stirring. 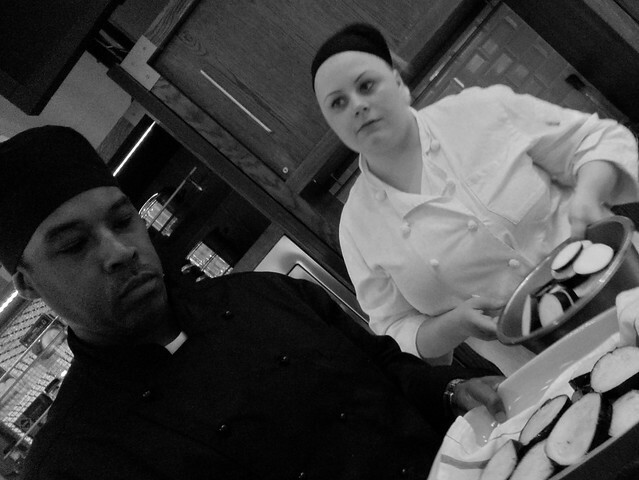 Chef Alan must be exceedingly strong as he kept it up with a huge quantity of bechamel. Well done that man. Another good trick is that you add the eggs in the bechamel after you’ve left it to cool somewhat. I’ve been doing it wrong for years – which shows you how little we think about recipes we’ve learned in our family kitchen. He also sprinkles a little bit of cinnamon over the bechamel sauce which I found a bit weird. Don’t get me wrong I ate my portion and it was lovely but I’m unaccustomed to cinnamon on moussaka – even though I use it liberally in my cooking. I usually sprinkle some Parmesan cheese over mine but he said that effectively that overpowers the bechamel. He might be right. All in all I’m chalking this one up as a #win. I loved the pointers on moussaka (you can never stop learning) and I am glad I had to re-think my opinion of The Real Greek. Oh, by the way. For any Greeks in London (I know your pain) apparently they have FRAPPE on the menu. (Stampede ensues). Check out the frappe video recipe if you don’t know what I’m talking about. Without further ado, here is The Real Greek moussaka recipe. I’ll try and do a video in English at some point in the future. More pics (and my customary disclosure statement) below the recipe. In a medium sized saucepan add 50mls of your oil and fry off your red onion on medium heat until soft. Then add your beef mince and mix until mince becomes brown. Then add your tomato puree, tinned tomato, red wine cloves and cinnamon and mix well. Let this cook dawn for 45 mins then add salt pepper and leave to the side to cool. In a larger saucepan add the rest of your oil and bring to medium to high heat. Add your potatoes to the oil and fry until golden brown or soft and fluffy in the middle. When this is done place onto a clean cloth or kitchen roll to remove excess oil. Follow the same procedure as potatoes but aubergine will only take 10mins to fry. It is important to remember that your potatoes and aubergine are covered with the oil. Meanwhile in another saucepan add 2 litrs of milk and heat until warm. Take another pan and add 250g of butter on a low heat until all butter is melted. You should end up with a golden sandy textured mixture. 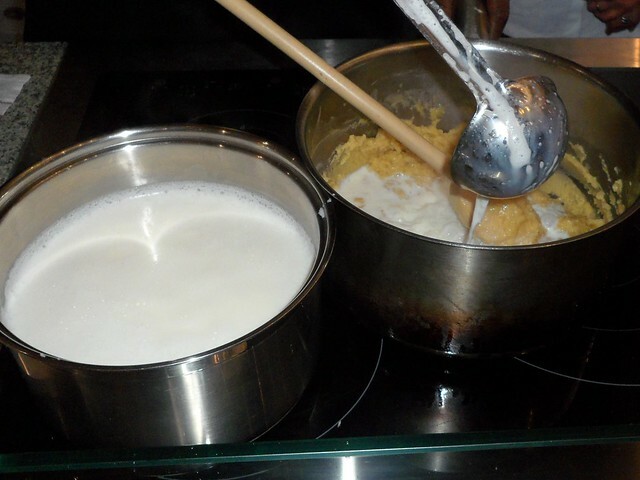 To this mixture start to slowly adding your warm milk, ladel by ladel, mixing with a spoon or use a whisk if you prefer. When the milk is finished, keep whisking, and let it cook out for about 10 mins. Add 2 whole eggs to your finished béchamel sauce and whisk in. In a medium sized oven dish lay out your potatoes followed by a layer of aubergine followed by a layer of all your mince, then add 1 more layer of aubergine. To finish pour your béchamel over the top and spread evenly, sprinkle the remaining cinnamon on top of your béchamel. To cook place in oven middle shelf and cook for 45 mins @160 degrees. Full disclosure: This was an event I was invited to. This is not a paid-for post but the workshop and dinner were free. The agency and the restaurant had no prior view of the post. This entry was posted in Auntie Sofia, Auntie's food stuff, Experiences, Main Courses, Meat - Poultry, Places to eat, RECIPES, TEXT RECIPES, THE OMNIVORES, TIPS & EXPERIENCES, TYPES, Vegetables and tagged chef, event, food blogging, mousaka, moussaka, restaurant, souvlaki, stratford, the real greek, westfield, workshop by auntie Sofia. Bookmark the permalink. Can I have e.g 4 person moussaka recipe that recipe I seen is almost 15-20 person. We also liked the love you showed in presenting the beautiful Greek appetizers.